Okumura Jun has doubts. He is Not of The Body. Tobias Harris is without doubts. He is Not of The Body! 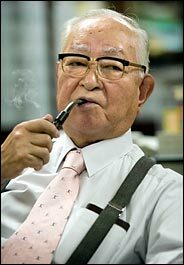 Ishizuka Masahiko is a councilor of the Foreign Press Center and an Unbeliever! Garrett de Orio and Ken Worsley are Unbelievers and are Uninvited to The Festival at Red Hour! Unbelievers! Not of The Body! I throw myself before the Will of Landru! Will the Festival at Red Hour have a buffet? My scruples, opinions, and judgement (or lack thereof) can be bought with food and drink in many cases. Is he of the body?